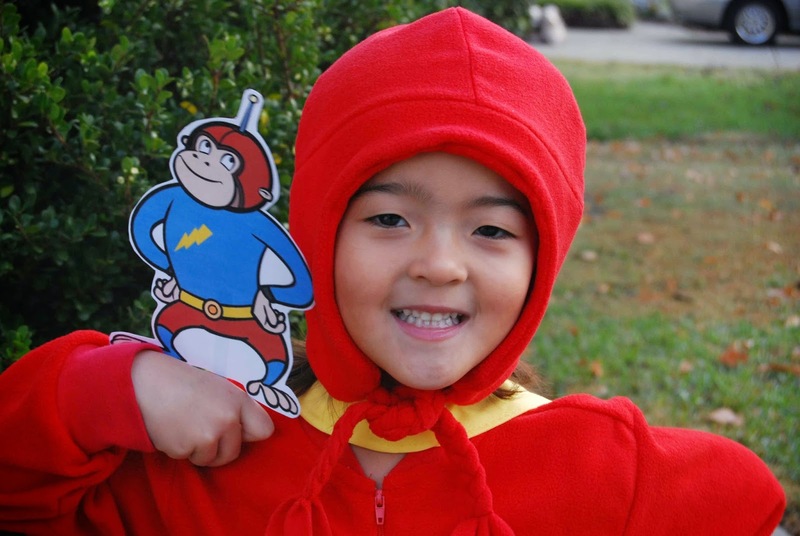 Happy Halloween 2014- Word Up! Sentence of the Day- "Stop the Bats!" Wordless Wednesday- "Welcome to Moe's!" Flying at the speed of sound. Vocabulary that astounds. Watch out villains, here she comes!" "Faced with a catastrophe, we need the living dictionary! Her superior intellect keeps the crime world in check! 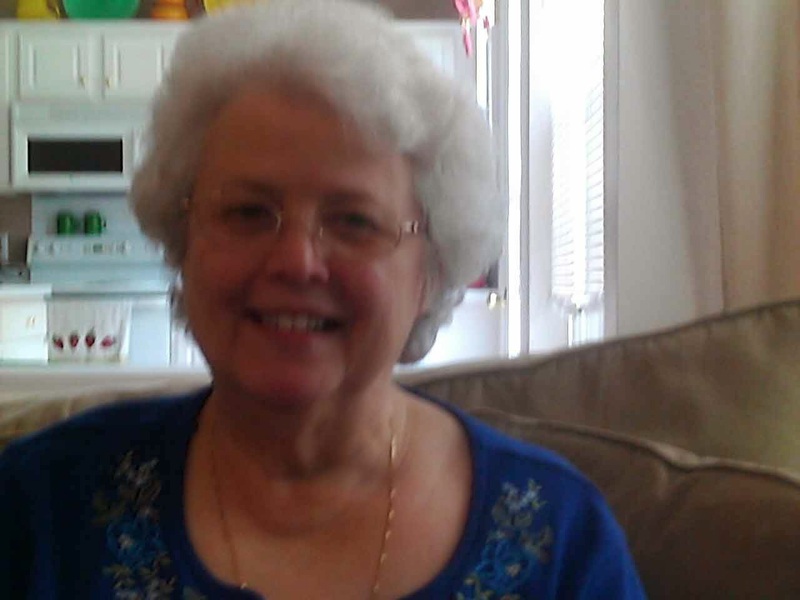 "Huggy Face is by her side, vocabulary a mile wide. She'll make sure that the crime won't pay, and throw some mighty words your way! "Watch out villains! Here she comes!!" 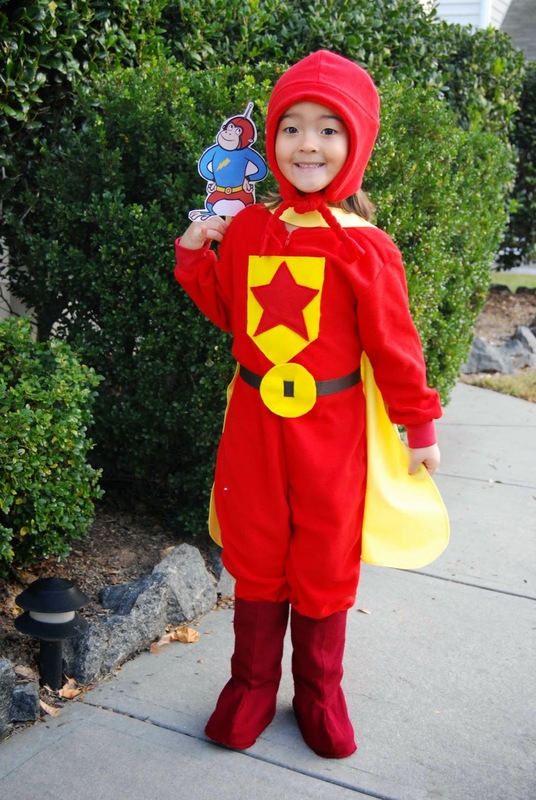 Also, Lil' Miss was in our local newspaper, too! Tonight, as Ted was leaving Katy's room from tucking her in for the night, she called out to him saying "If you need me, Daddy-just call. I'm going to be up for awhile." Truer words were never spoken.... hahaha...!! 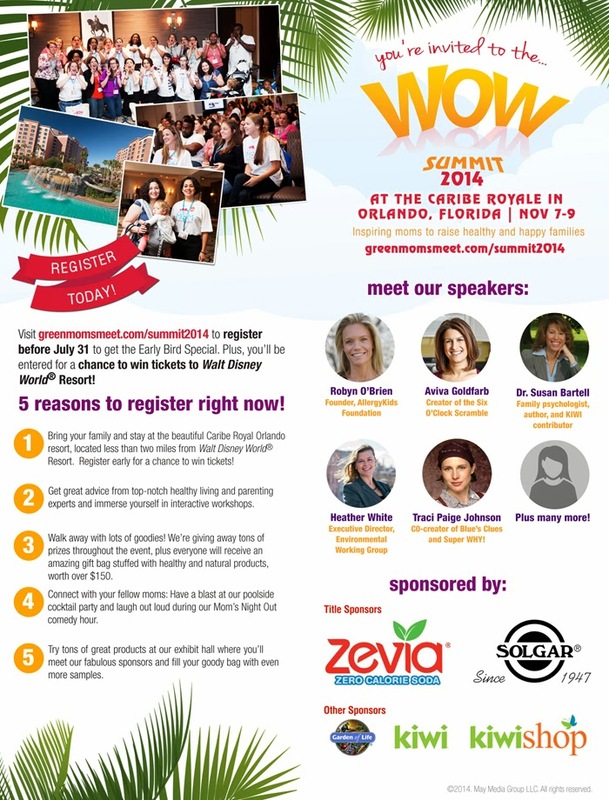 #WOWSummit 2014, is approaching fast! The conference will take place in the ever-popular Orlando, FL Nov. 7-9, 2014. Some of the great sponsors lined up for this event include Zevia, zero-calorie soda, Kiwi/Kiwi Shop and FluNada. Visit http://www.greenmomsmeet.com/summit2014-register for more information and to register for this great event! I'll be there... will you? 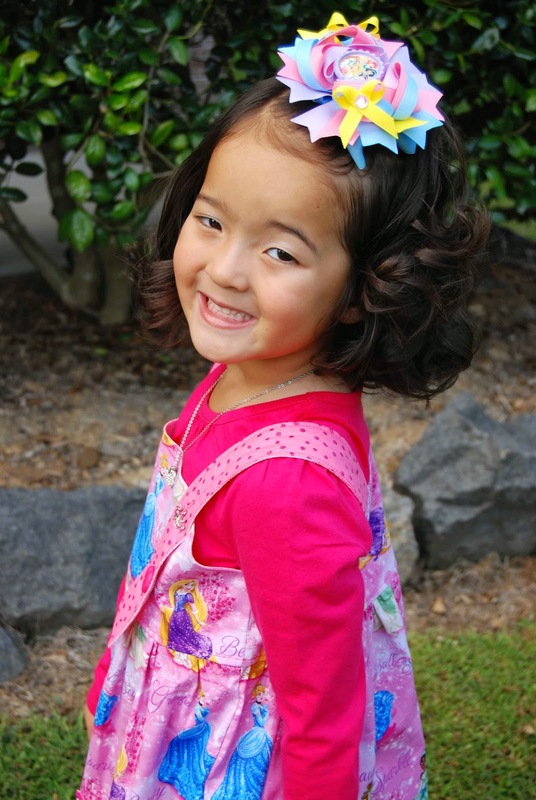 Nanny and Poppy gave Lil' Miss some Halloween hair bobbles for the upcoming October holiday. I was doing Katy's hair, this morning, and she was selecting which one to wear. As she was hemming and hawing, she enthusiastically exclaimed, "These (hair bobbles) make me burn with delight!!" (I did not make that up- straight from Katy's mouth!!) Oh my goodness, that girl cracks me up!! The things she says....!! Sponsored Post- LLK Peasant-Style Sewalong- Day 5- Show Off Your Work! Day 5- Show off Your Work! Hello and welcome to our fifth installment of the LLK Peasant-Style Sewalong. All week, we've been sewing up the Aria Ruffle Dress. Wasn't it fun?! 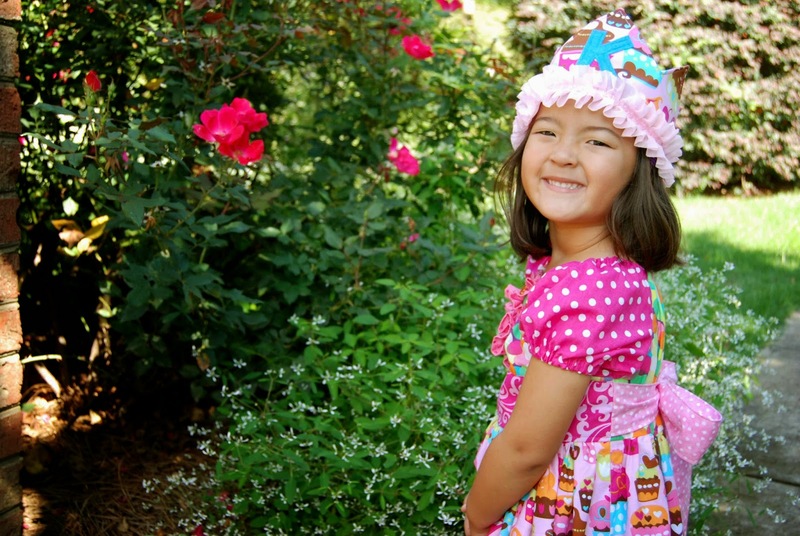 A peasant dress was one of the first "official" things I learned to sew, several years ago. 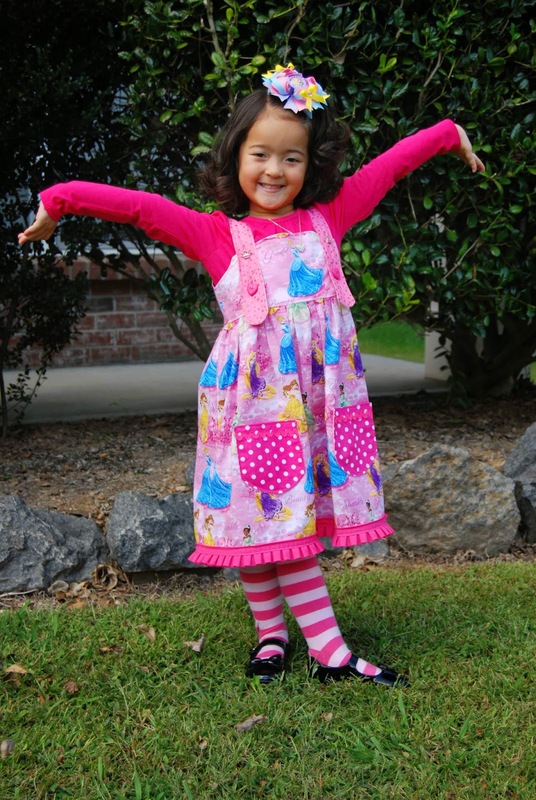 I'm a self-taught sewist and I remember being so proud of myself for actually sewing a dress that my daughter could wear! The great thing about a peasant-style dress is the fact that everyone- from beginners to seasoned sewists- can end up sewing a really beautiful dress. 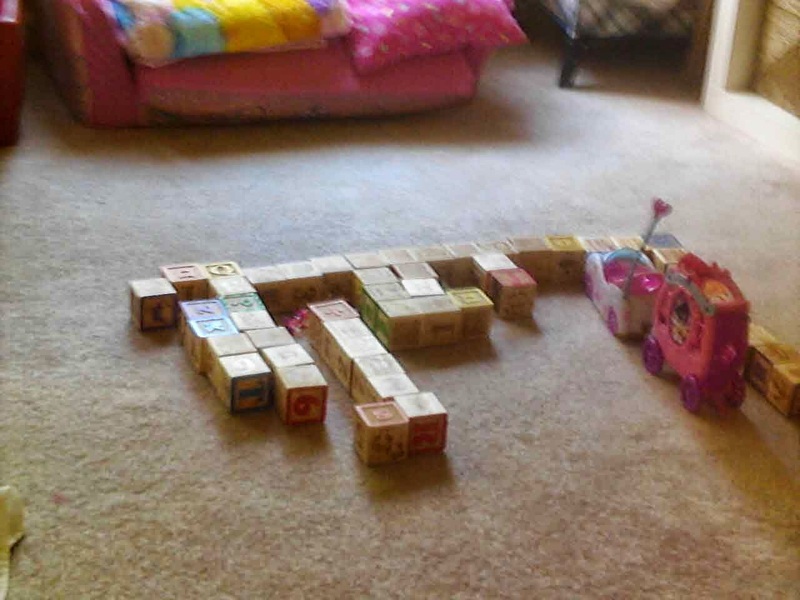 There is so much room for personalization and creativity!! -One page of patterns. That's it! No wasted ink, no gobs of tape. One! Page! -I love that I was able to use so many different scraps of material and still create a gorgeous (if I do say so, myself ;-), cohesive dress. This dress also brings back so many memories of projects past- The bodice was left over from Lil' Miss' Easter 2014 dress, the Side Sashes were from the very first sewing pattern testing I did, Lil' Miss once selected the sparkly dot fabric used in the tuxedo ruffle. All together, it just makes me smile! -As with most peasant-style dresses, I love that there are no buttons (except for trims), zippers, etc. Lil' Miss can easily dress (and undress) herself. -While I didn't have time to sew one up (yet! 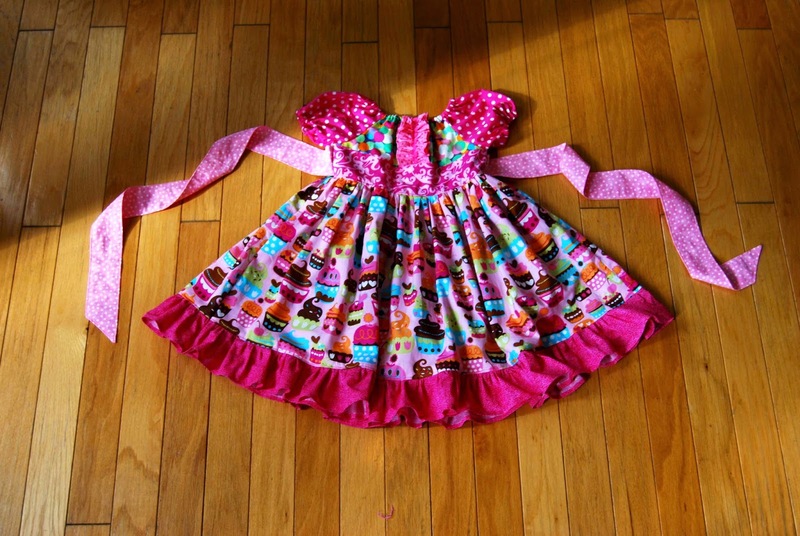 ), the Aria Ruffle Dress comes in a doll size! Yay! Now, let me show off my finished Aria Ruffle Dress!! Wait! Our sewalong isn't quite finished! Way back on the first day, I mentioned the Princess or Birthday Crown. 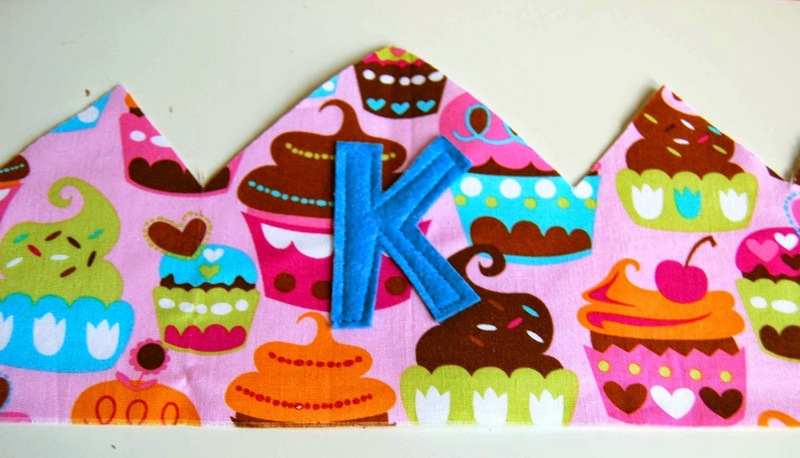 I also had time to sew up this sweet, little coordinating Princess or Birthday Crown for my little princess. So quick and easy, you'll be making crowns for everything.... including, say, Halloween (which will be here before we know it! ;-). Princess or Birthday Crown- "K" detail. Unlike the tutorial, I used felt (the edges don't fray!) and attached it to the front crown piece before sewing the front and back crown pieces together. 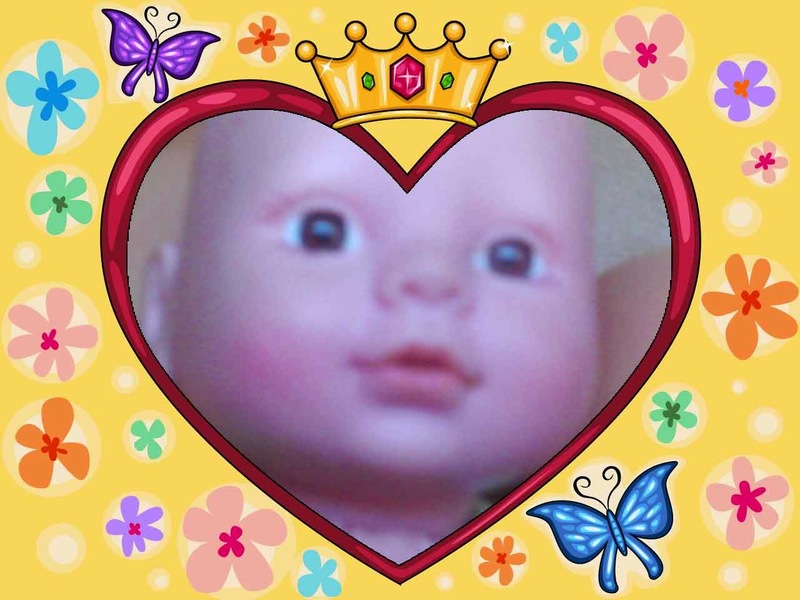 Thanks so much for joining us this week, in the LLK Peasant-Style Sewalong! Also, thank you for allowing me to be your leader, this week, in this fun sewalong. 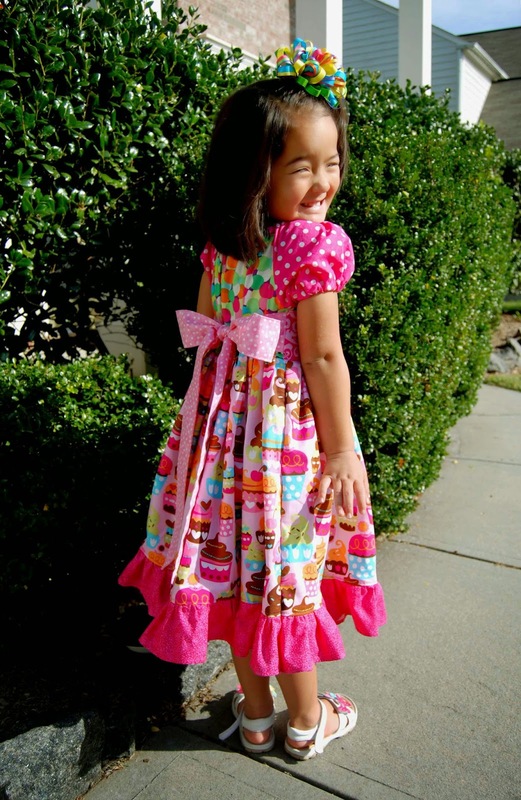 I hope that you had as much fun as I did sewing up the Aria Ruffle Dress! 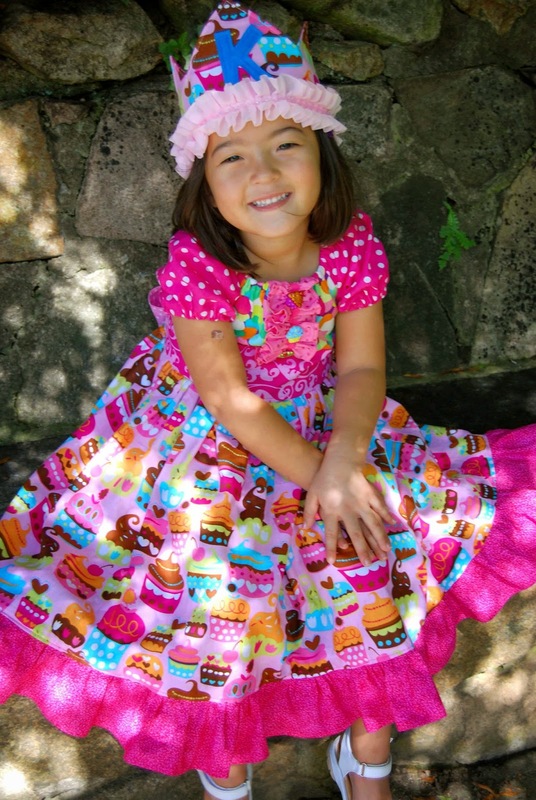 Don't forget to submit pictures of your finished dresses on the LLK Cafe- you could be one of our winners! Please use the hashtag "#LLKPEASANT" in order to be considered for a prize. 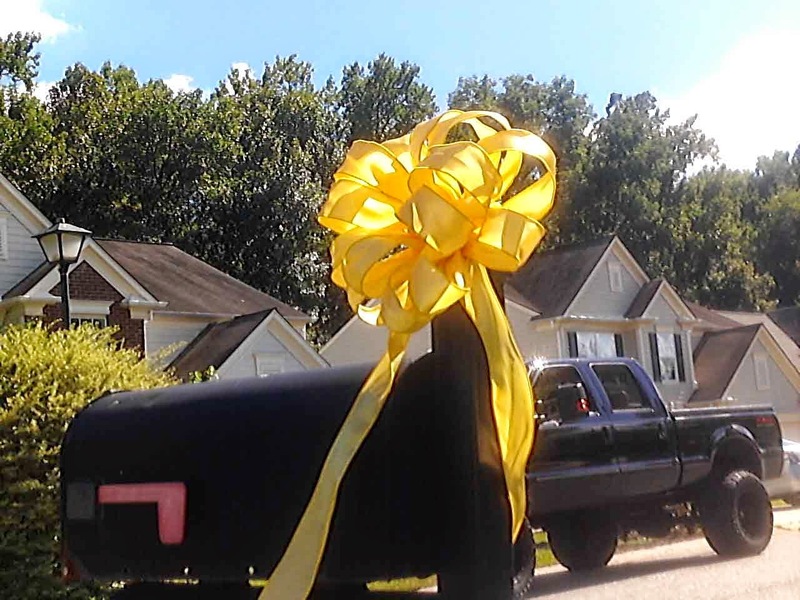 There will be three winners selected. One from each of the following categories, 1)Fan favorite, 2)LLK favorite, 3)Participation Winner (selected by www.Random.org). Hello, lovely readers! How are you doing with the LLK Peasant-Style Sewalong? Any questions? Feel free to ask your questions on the LLK Cafe (FB group). Finished Bodice (Day 2), Finished Skirt (Day 3). Now, let's jump right in and finish our dresses! Sew through "Attaching the Skirt to the Bodice." Don't forget to finish your edges and topstitch around the bodice. Now, here is the point in the sewalong where you get to pull out the fun notions! For me, I have these sweet little sparkly cupcake buttons that are the perfect compliment to the cupcakes in the skirt of my dress. I sewed the cupcake buttons onto the tuxedo ruffle. I just love the little accent of sparkle and whimsy they add to the dress. So fun! Let your creativity shine! Feel free to add trims and details to your dress for your own personal flair. Guess what? Now that you've added trims and details to your dress, you are done. That's it! 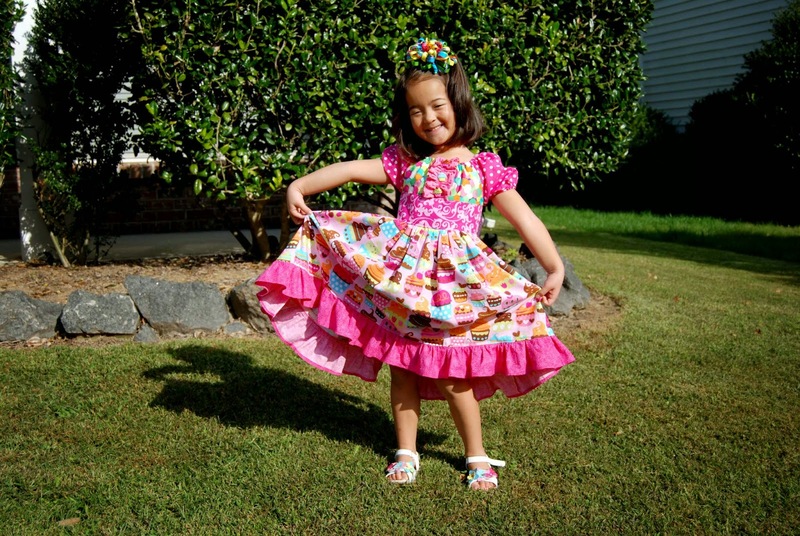 You've completed the Aria Ruffle Dress!! TaDa!! Go grab your favorite pint-sized model and get ready to show off your handiwork! If you have any questions, feel free to join the conversation at the LLK Cafe (FB Group). Yesterday, we created the bodice for the Aria Tuxedo Ruffle Dress. Today, we're going to tackle the skirt! Okay, let's talk about ruffles.... I have a love/hate relationship with ruffles. I love the sweet girly-ness that they add to a dress. I hate the teeny, tiny hems to iron and I hate all that gathering!! But, for the sake of the Aria Tuxedo Ruffle Dress, go ahead and do the ruffle. Trust me, you won't regret it! 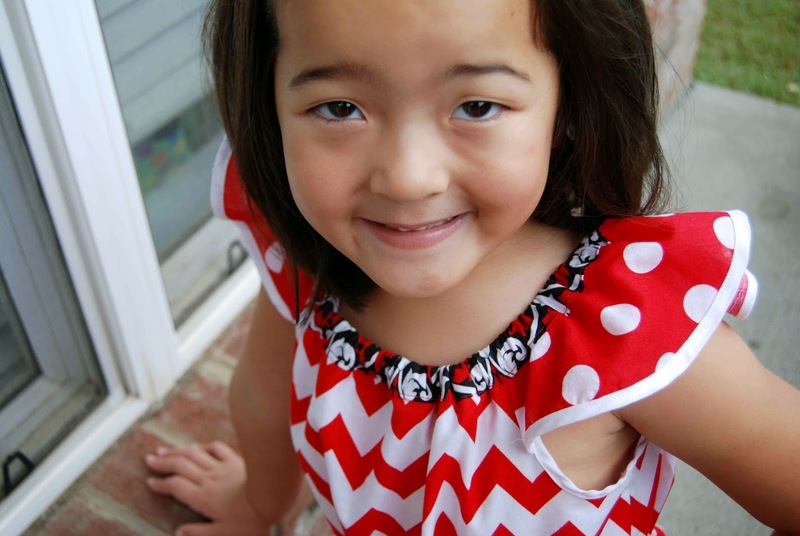 Plus, included in the Aria Tuxedo Ruffle Dress tutorial on slide 19 is a fun, different way to gather fabric- check it out! 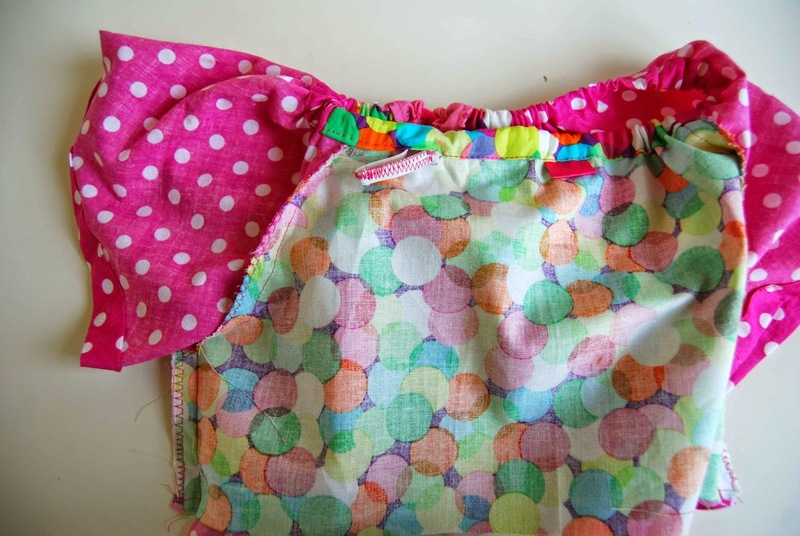 Sew your skirt panels together. 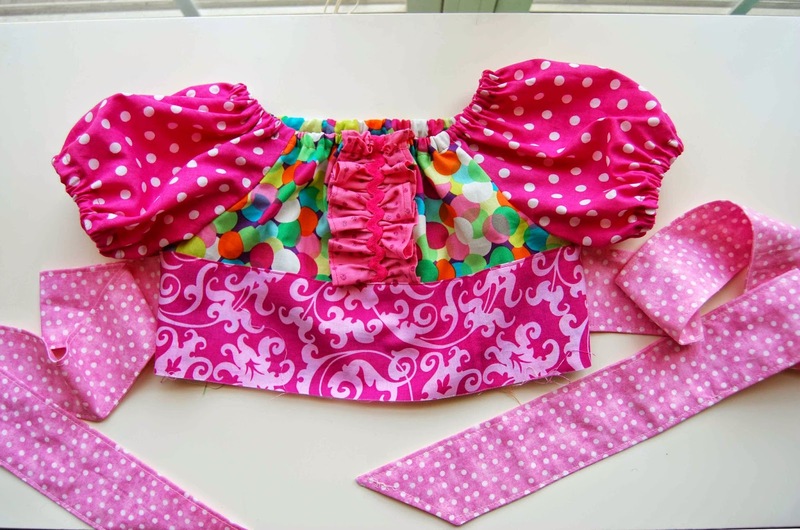 Sew your ruffle pieces together. Ruffle your ruffle (Hey, wasn't that an old chip slogan, back in the day? ;-). Lay everything out flat. Match the length of your ruffle piece to the length of your skirt piece(s). Match the length of the ruffle to the length of the skirt. 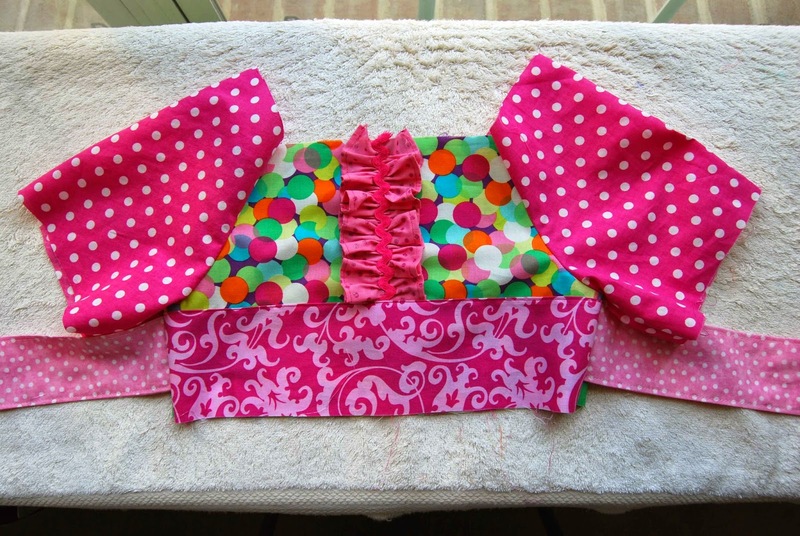 Attach the ruffle to the bottom edge of the skirt. Now, sew through "Gather the Skirt." Tomorrow, for Day 4, we're going to bring it all together and finish the Aria Tuxedo Ruffle Dress! See you tomorrow! This past weekend, we got our in touch with our "Dixie side" and attended the Dixie Classic Fair with our friends, the Keys family. The weather was drizzly and a little too cool (for my liking! ), but the girls had lots of fun riding the rides (and not having to wait in lines!). At one point during the day, we consulted our fair schedule and decided to attend the acrobat show. As we were walking over to where the show was supposed to be, Katy asked us where we were going. Our friend, Justin, answered, "We're going to see the acrobats." Horrified, Katy turned around and vehemently exclaimed, "I don't want to see BATS!!" I hate bats!!" I recently had the pleasure of reviewing Felicity Sewing Patterns newest PDF sewing pattern, the Peachy Dress and Playsuit. 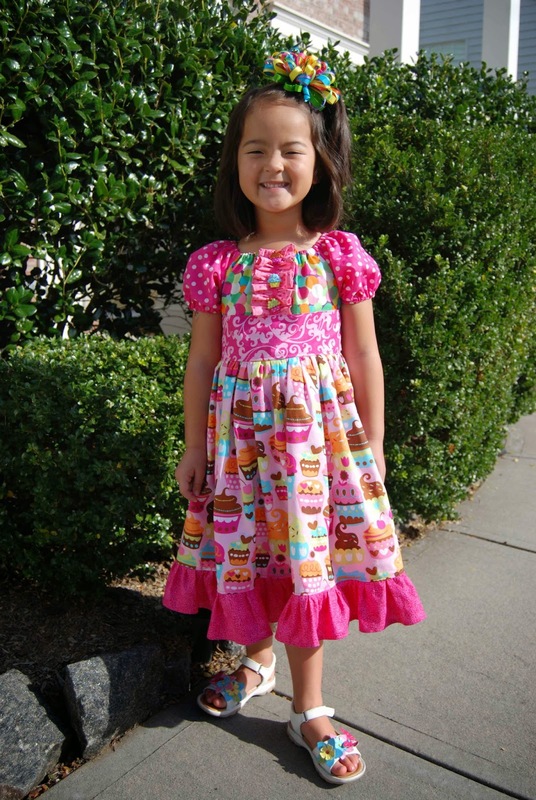 Before reviewing this pattern, I had heard of Felicity Sewing Patterns but I had never sewn one of her patterns. Now that I have, I'm definitely going to be coming back to this designer! 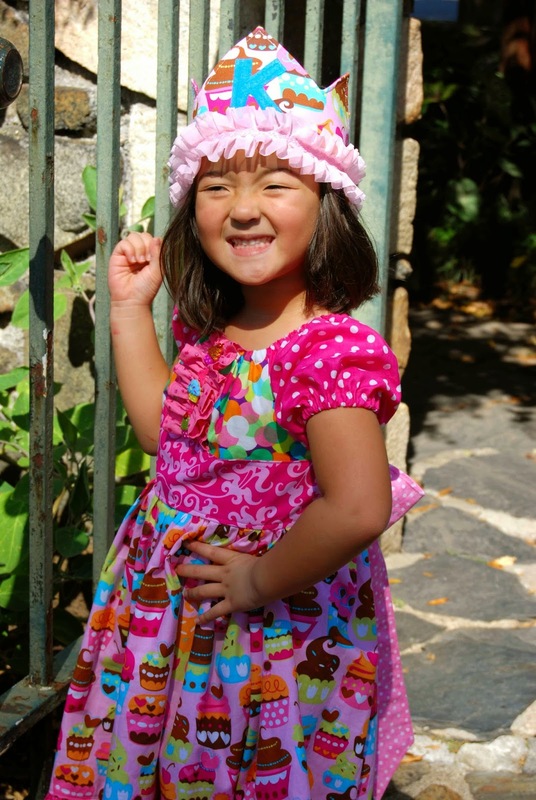 The Peachy Dress and Playsuit has a ton of options to sew up- dress, playsuit, shoulder frills, neck frills, etc.! 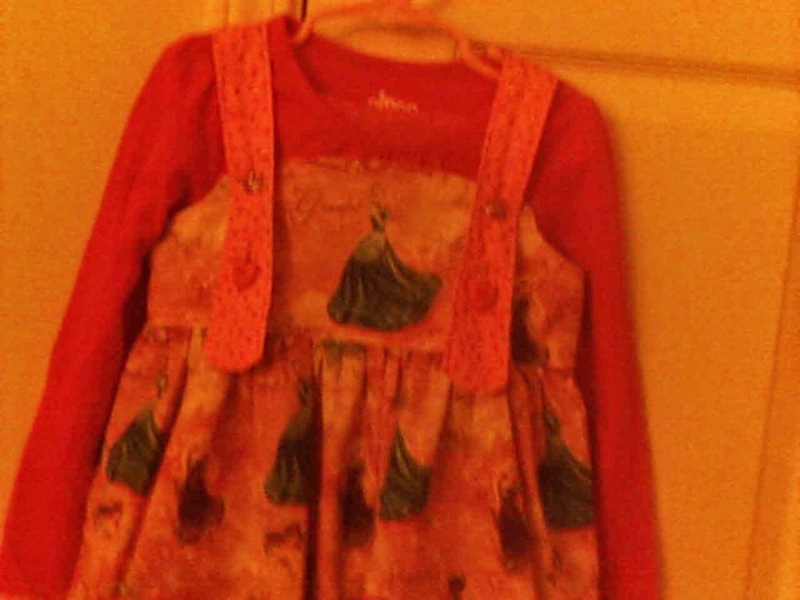 I chose (er, rather, my four year old chose ;-) the Dress with Shoulder Frills option. 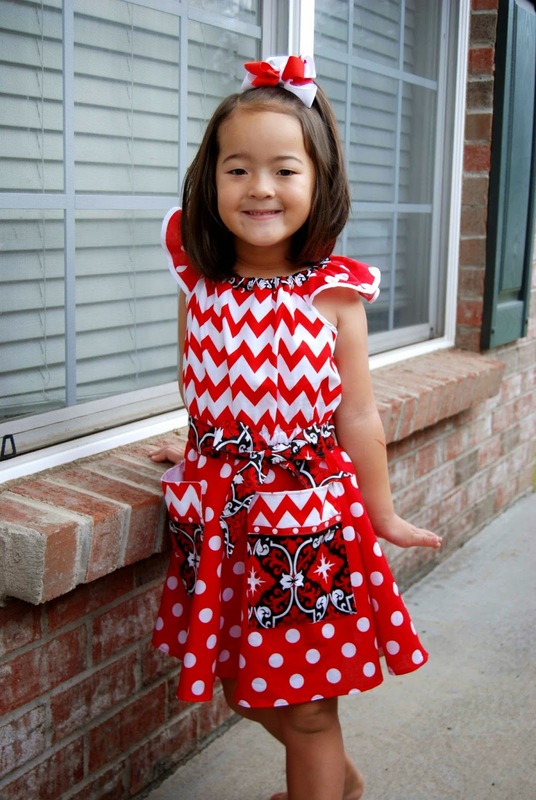 -Included in this pattern are six different options- Basic Dress, Basic Playsuit, Shorts, Dress with Shoulder Frills, Romper with Neck Frill and Pillowcase Dress/Top. Essentially, that boils down to six different patterns for the price of one. Win! 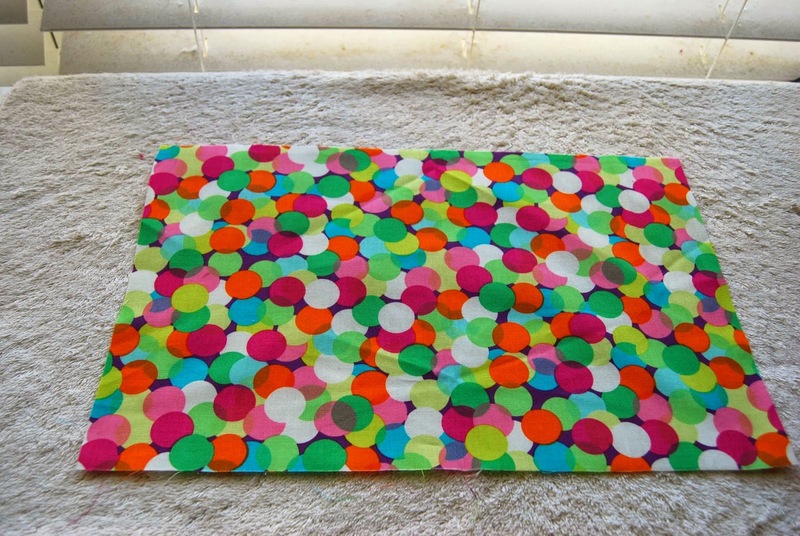 -This pattern is written for size 2-14. That's a huge size window, which means that it will last a long time! -Because of the bias binding for the armholes (and in my case, the shoulder frills), the end product looks really finished and polished. I was really happy with how a little bias tape helped "finish" the dress and add detail. -The pattern is written for woven fabrics. Because of the multiple pattern pieces, this allows for some creative mixing and matching of fabrics and patterns. I loved mixing chevron, polkadots and a busier design together in one, cohesive dress. 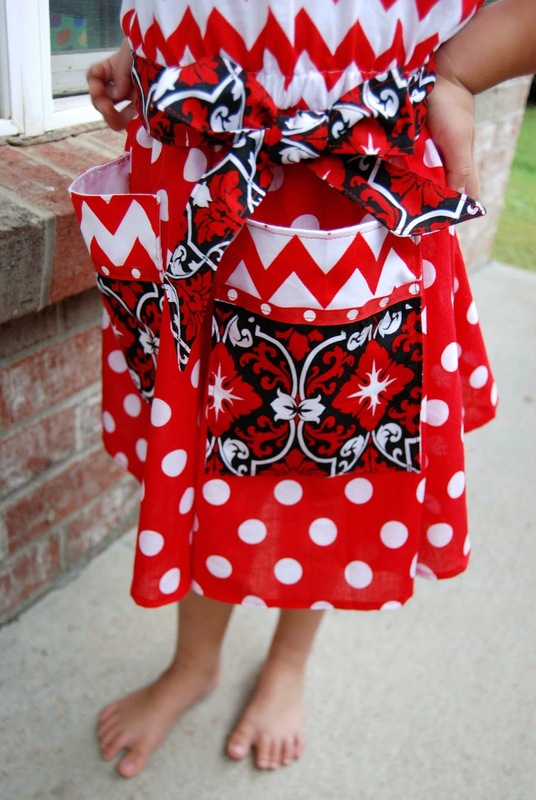 -Any pattern with pockets is a win with my daughter. She LOVES anything I make for her that includes pockets. With this pattern, you have the option of in-seam pockets or exposed pockets. Peachy Dress and Playsuit- Pockets! -The sweet shoulder frills add a sense of femininity without being overly obnoxious. -I really like the cinched elastic waist on this pattern. This helps define the dress and not make it so loose and baggy. 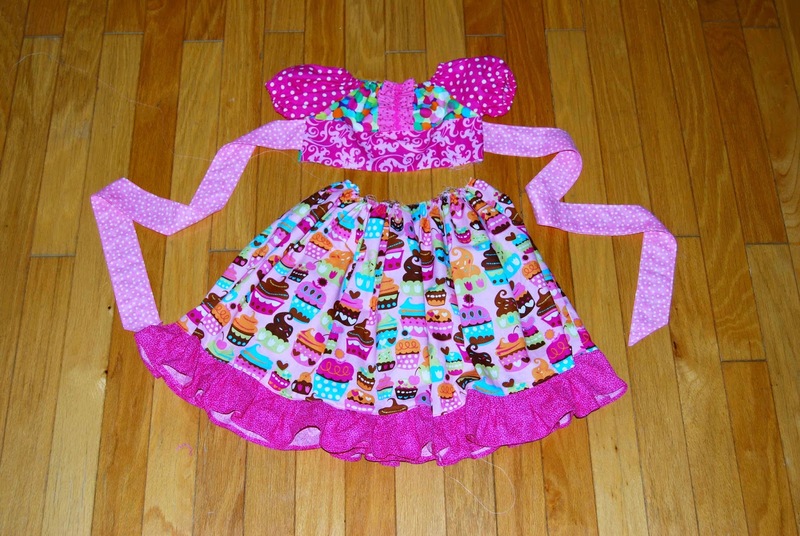 -I made the size 5 and I felt like the dress fit my daughter well. She's in an awkward in-between sizes (between size 4t and 5t in ready to wear) and the size 5 fell right at the top of the knees. The bodice was roomy without being voluminous. -LOTS of pictures throughout the tutorial. The pictures are clear and descriptive. They definitely aided in my understanding of the overall pattern and sewing process. -I liked that each step was written almost like a bullet point, in it's own box. Easy to understand. Clear, concise and to the point. -Because of the size of the tutorial (79 slides, total- including pattern pieces! ), you do tend to do a bit of scrolling and referencing. -The tutorial is well-written and easy to understand. Steps are described fully and without question. 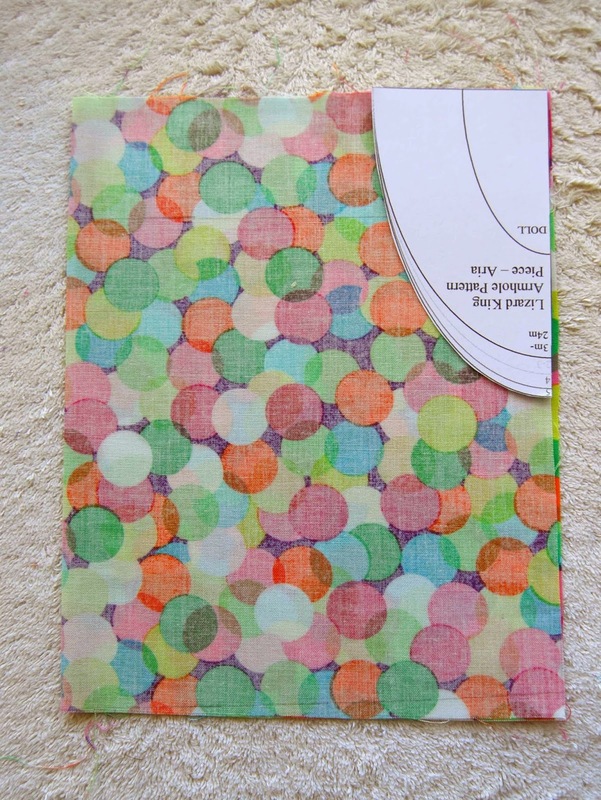 -Personally, I appreciate when a designer shows a picture of their pattern piece layout on the fabric. This helps me understand which way to cut my fabric and how to get the most out of the yardage. -Also, I LOVE when a designer shows a picture of the pattern layout. This is really helpful in putting together the pattern pieces. Honestly, in my opinion, this is one of the single-most helpful thing a PDF sewing pattern designer can do to ensure a successful pattern! No questions on how to put the pattern together- love that! Welcome back, readers! This is day 2 of the LLK Peasant-Style Sewalong. Today, we will be focusing on sewing and completing the bodice for the Aria Tuxedo Ruffle Dress. 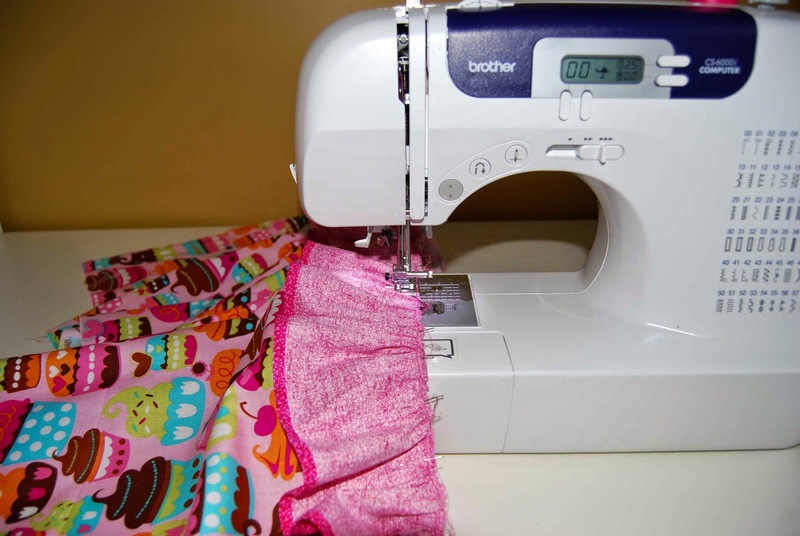 If you haven't started sewing, yet, it's not too late to join in! Alright, onto today's task- sewing the bodice! Go ahead and grab your 2x bodice pieces and 2x sleeve pieces. 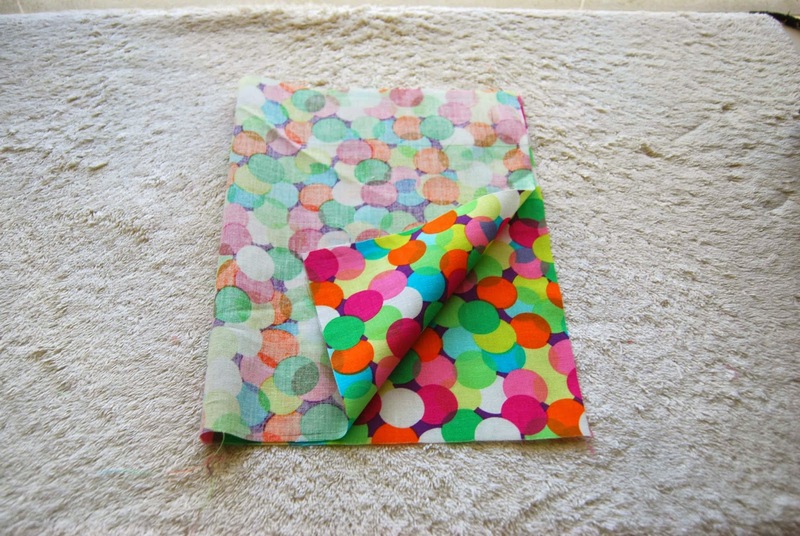 Fold it over (left to right- fold should be on your left, when viewing the fabric). 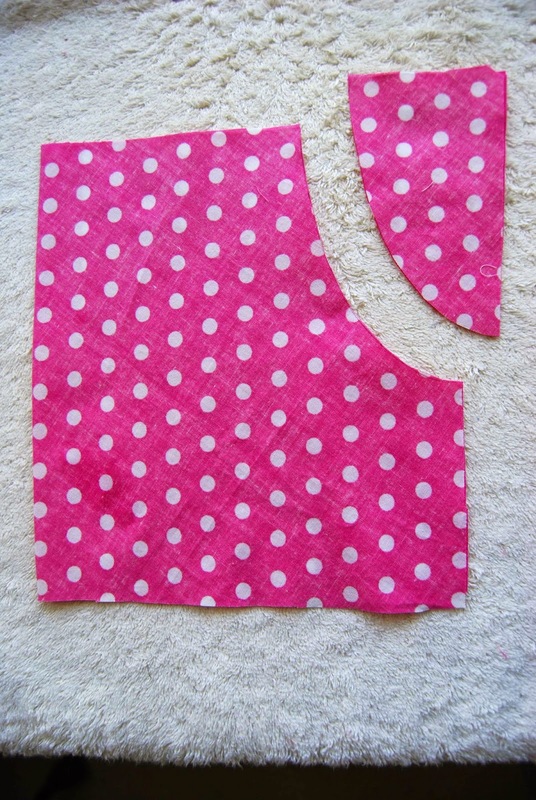 Place your armhole pattern piece in the upper right corner (see picture, below). Make sure that your top, straight edge is lined up with the top, straight edge of your bodice piece. Make sure that the side, straight edge is lined up with the UNFOLDED, straight edge of your bodice piece. Mark and cut out armhole. 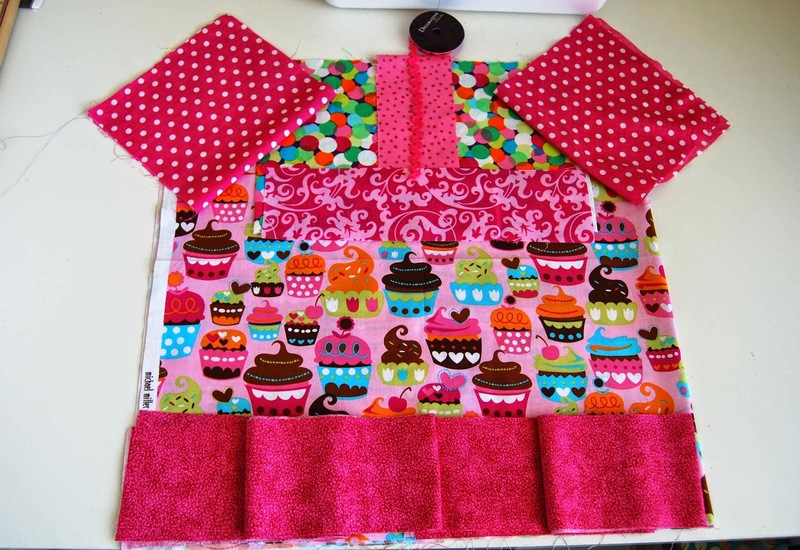 Repeat this step with the second bodice piece and the 2x sleeve pieces. Sleeve Piece and Cutaway Shown (Same applies to the bodice pieces). After you have attached the tuxedo ruffle to the center of the front of the bodice, feel free to add trim/lace. 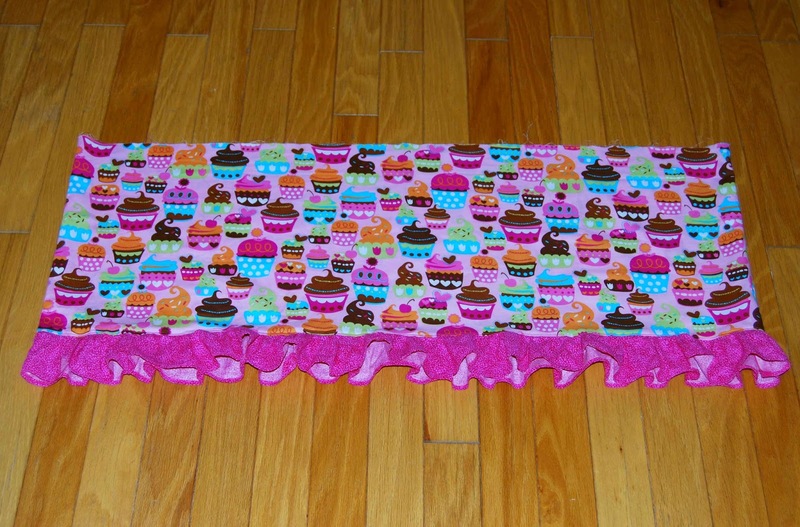 I added a bit of ric-rac to hide the center of my ruffle. 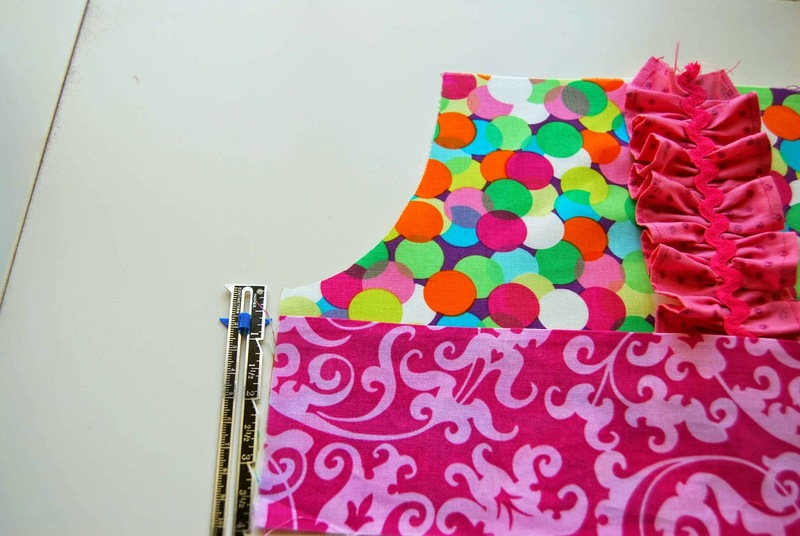 Take your center waist sash piece and fold one long edge under 1/4" to the wrong side of the fabric. Do this for one side, only! Line up the top edge (that you just folded under 1/4") of the center waist sash and place it 5/8" under the bottom armhole opening. This would be a great time to finish your edges where the bodice meets the sleeve, etc. 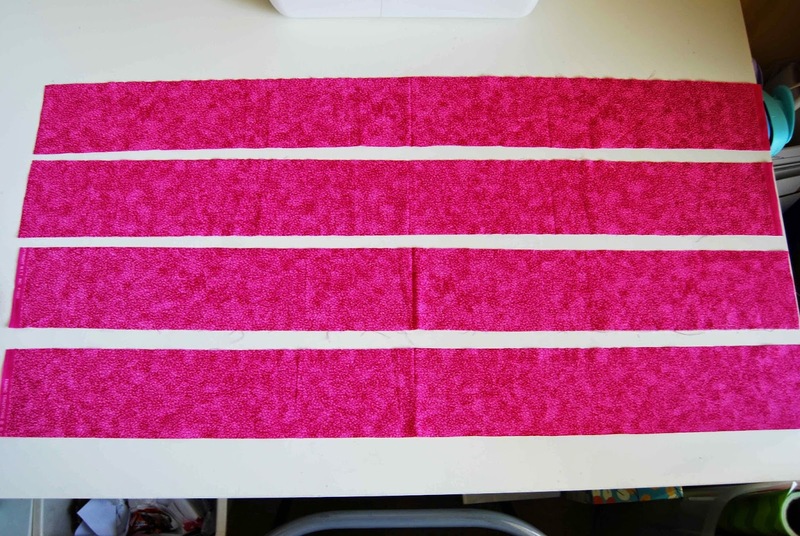 Serge or use a narrow zig-zag to finish and prevent fraying and unraveling. I do not own a serger. So, I just use a narrow overlock stitch to get the job done. :-) Easy peasy. Now it's time to sew the side waist sashes. Sew through "Preparing the Sides Waist Sashes." Don't forget to topstich around three sides, leaving one short end open. 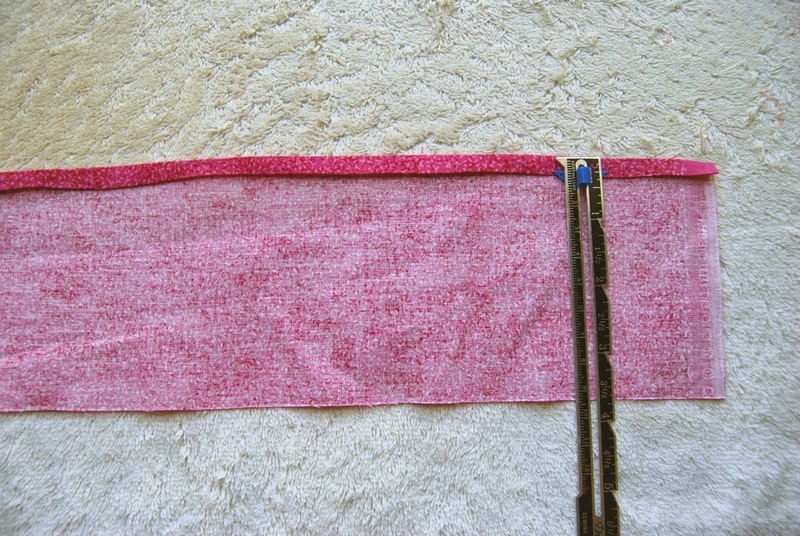 Align the top edge of your now finished side sash with the top edge of the center waist sash. Pin in place. Side Sash Placement- align sash tops. Sew through the step, "Preparing the Bodice." Just a friendly reminder to make sure that your side sashes don't get in the way of your side seams! 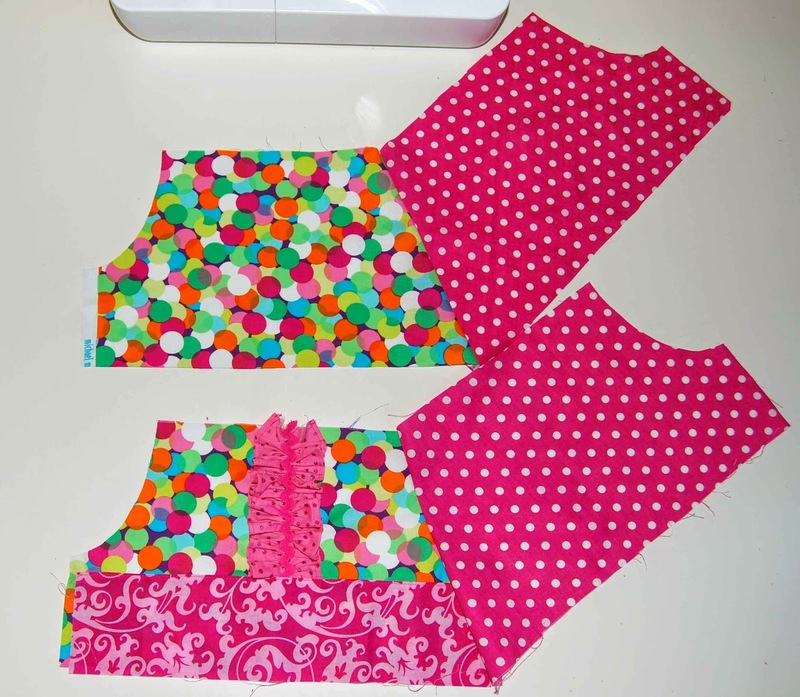 Sew through "Adding Elastic to the Neckline" and "Adding Elastic to the Sleeves." 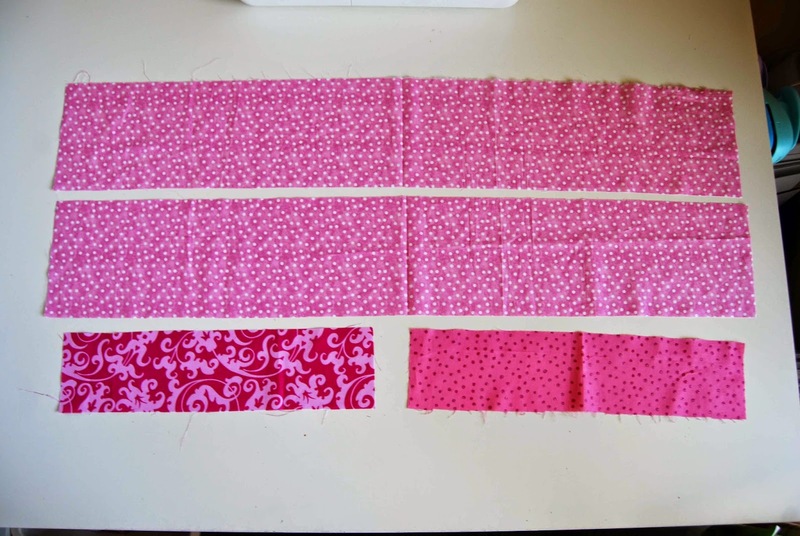 Use the measurements on slide 15 to mark/cut the elastic for both the sleeves and the neckline. Now, you should have a finished bodice that looks a lot like this! Take a little break and give yourself a pat on the back- you've created the bodice to the Aria Tuxedo Ruffle Dress!! Hello, lovely readers! Today, I'm thrilled to take part in the Little Lizard King October Sewalong! This is my first time leading a sewalong and I'm really excited to guest on the Little Lizard King blog, and right here on All Things Katy! Welcome, welcome, welcome readers new and old, sewists of all levels and those of you that just want to have a little sewing fun! -A sewalong is a personal sewing challenge done in "community" with others throughout the internet. It will end in the creation of a beautiful peasant-style dress. 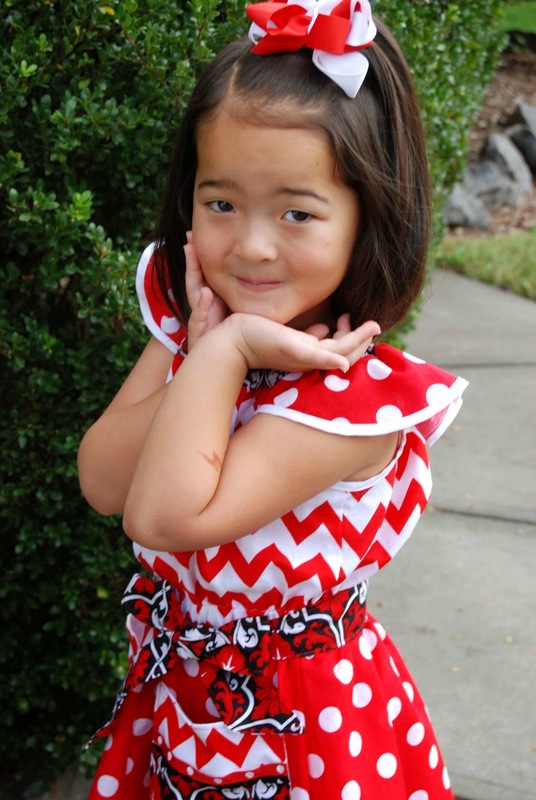 -This week- Monday, October 13, 2014- Friday, Friday, October 17, 2014-, we're sewing up peasant-style dresses (Personally, I'll be sewing up the Aria Tuxedo Ruffle Dress). I will do one blog post, each day, walking you through the steps of creating the Aria Tuxedo Ruffle Dress. -Second, follow along with the sewalong on either the Little Lizard King blog, or, right here on All Things Katy! I'll be posting daily, with pictures, tips and suggestions. 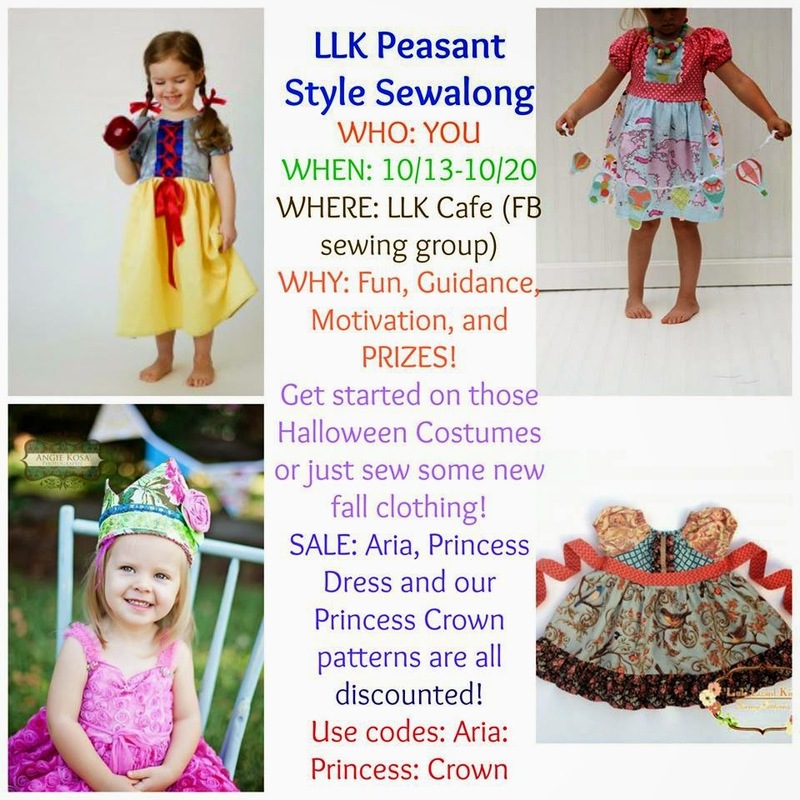 -Lastly, using the hashtag, #LLKPEASANT to share your beautiful creation(s) on the Little Lizard Cafe (Facebook Sewing Group). You MUST use the hashtag, " #LLKPEASANT" in order to be entered in the contest. Okay- is everybody ready? Let's get started! 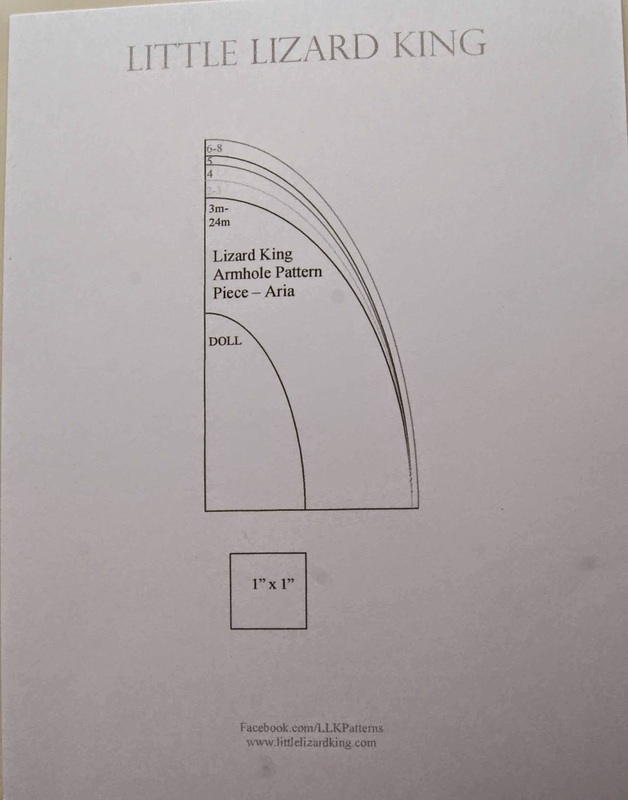 Now, print out your pattern piece. 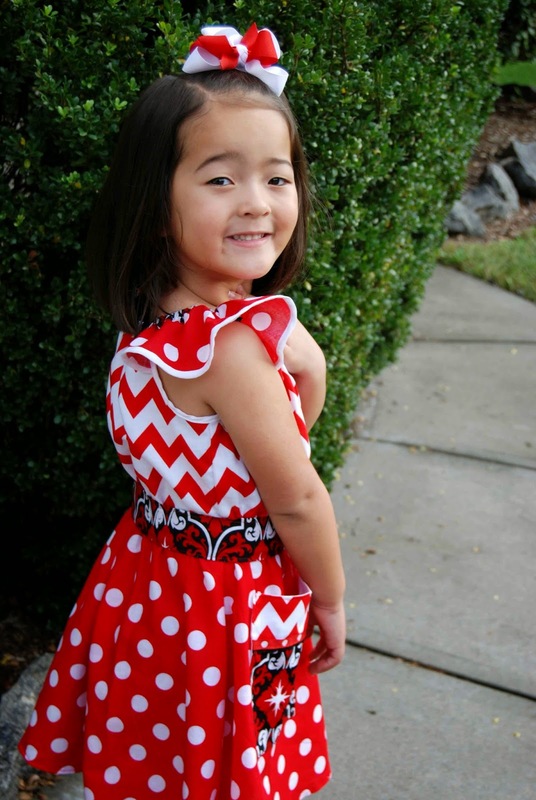 For both the Aria Tuxedo Ruffle Dress and the Princess Dress there is just one page of pattern pieces to print. One! That's it! No pattern assembly required. No tape needed.. Couldn't be simpler- just print, cut out the appropriate size (For the sake of this sewalong, I'll be sewing the size 5. Any measurements that I reference throughout the sewalong will be pertain to size 5.) and be done- love that! 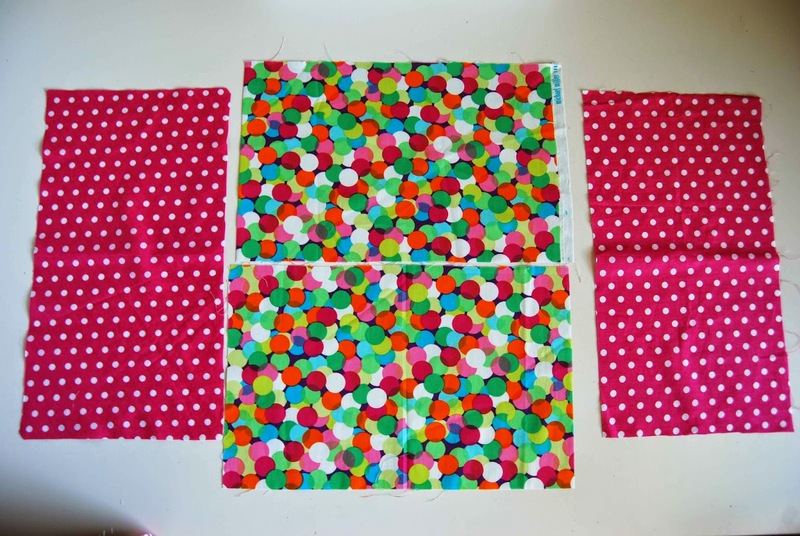 Now, here comes the fun part- select your fabric! Look through your fabric stash (Or, if you are lucky enough, go SHOPPING :-) and decide what fabric should be the bodice, which should be the sash, the skirt, the ruffle, the sleeves, etc. Another really great thing about the Aria Tuxedo Ruffle Dress is that it has a kind of "bohemian" feel to it. This means that as long as all the fabrics have the at least one little part with the same color, it will more than likely coordinate and flow as an overall dress. 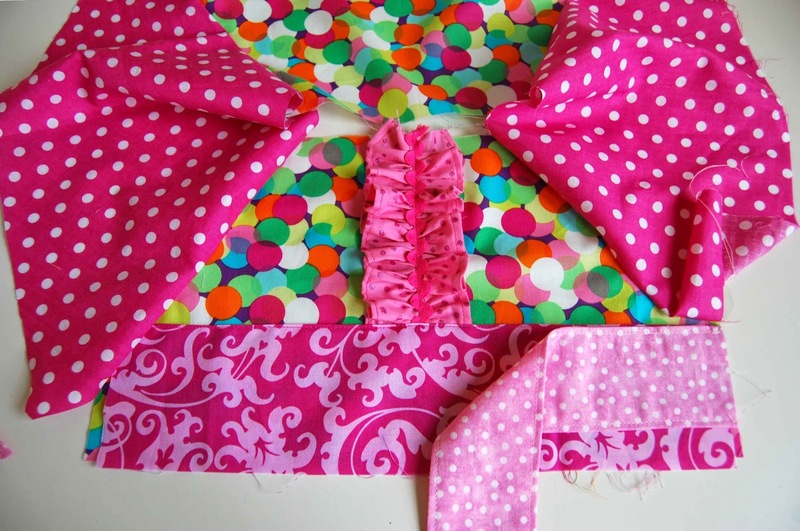 Here are the fabrics that I chose for my Aria Tuxedo Ruffle Dress. Sadly, my Lil' Miss is getting to the size where just one yard of fabric isn't enough for a full dress. 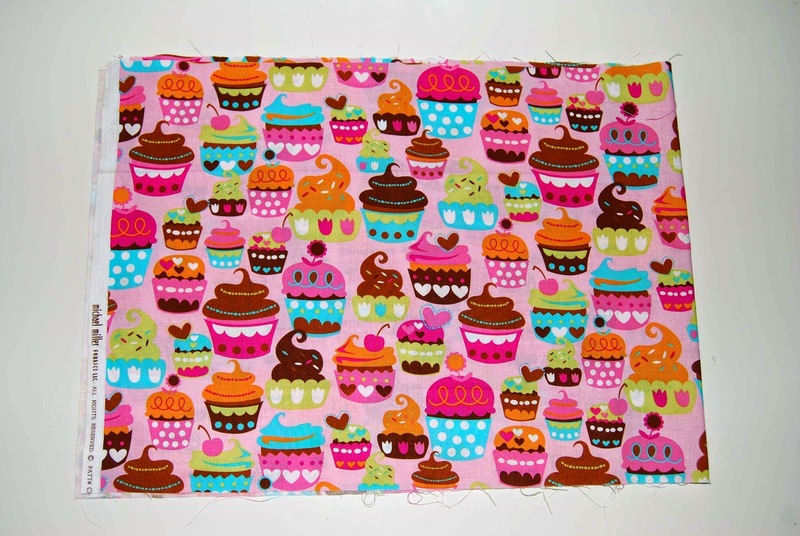 I've been sitting on this Michael Miller Sweet Treats fabric for some time now, not sure what to create. So, combined with various other scraps, the Aria Tuxedo Ruffle Dress is a perfect way to use up my hoarded precious fabric! Our final task for Day 1 of the LLK Peasant-Style Sewalong is to cut out our fabric pieces. Cut the fabric according to the "Measurement Chart" on slide 3. Cut according to the size that you are sewing. Once again, for the sake of this sewalong, I'll be sewing a size 5. For the Aria Tuxedo Ruffle Dress, each pattern piece will be a rectangle (Tomorrow, I'll show you how to use the armhole pattern piece we printed out, above). For now, just cut out your rectangles. Press each piece so that it's nice and smooth. Once you've selected your fabrics and cut your pieces, go ahead and take a little break. We'll be picking up, right here, tomorrow. See you then! The other night, Katy was fighting bedtime (what else is new?!!). After asking for one last story, one last glass of water and one last million other requests, I sternly instructed her that she was, "....not to leave her bedroom for any reason other than going to the bathroom..."
We didn't hear anything after that. Our usual routine before going to bed ourselves, is to go in and check on Lil' Miss. Well, we were in for a surprise! When I cracked open the door, I couldn't find Katy anywhere on her bed! Panic! 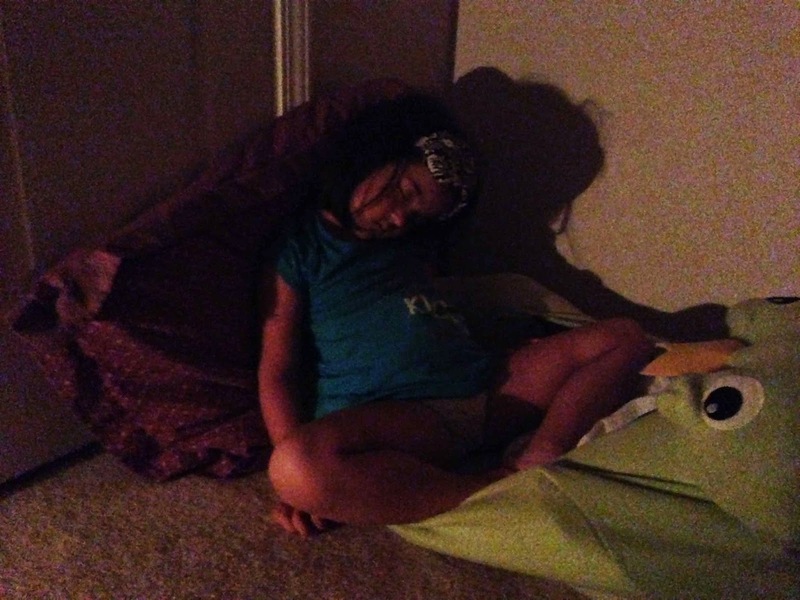 Then, I scanned the room and found her sitting straight up, sound asleep in the corner of her room. What an eclectic group of words! Baby Doll Maggie (of course). 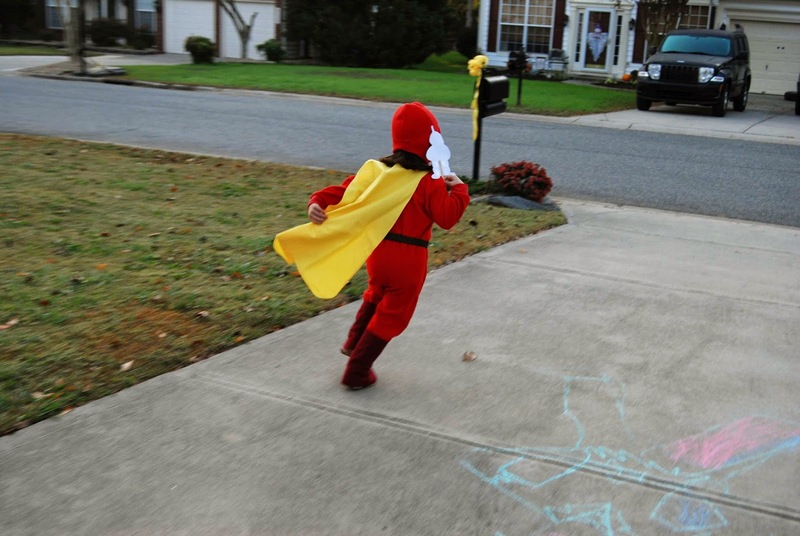 "Look out Disney on Ice, Princesses and Heroes, here comes Katy!" 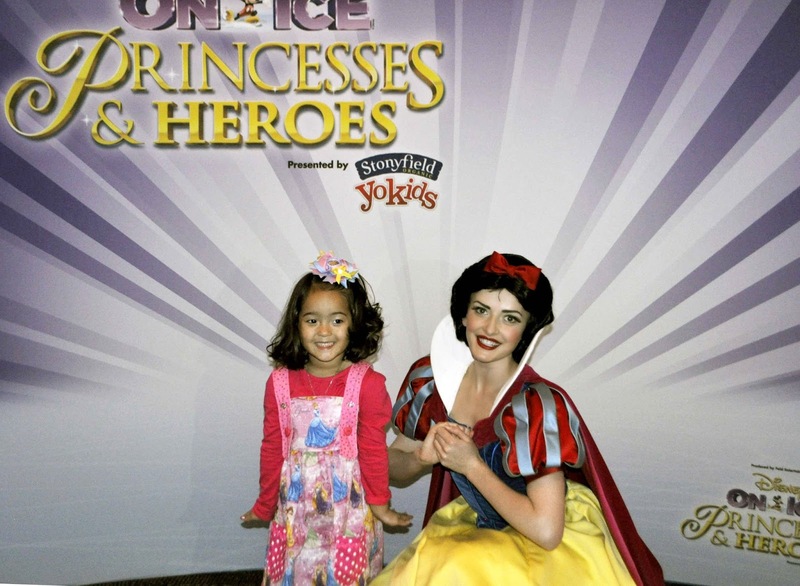 Last week, we had the opportunity to go see Disney on Ice, Princesses and Heroes. We didn't tell Lil' Miss where, or what we were doing until we were literally in the car, en route. Instead, we decided to make the whole outing a surprise. First, we did a meet and greet with Snow White and Belle. Katy was SOOOOooo excited! Then, after some nosh and some hugs from the princesses, we headed into the rink to enjoy the show. Our seats were nice and close and we had a fairly clear view. Of course, Lil' Miss insisted on some popcorn (we nixed the $12 cotton candy). Overall, the skating was really good and the show was entertaining- even for the adults. Katy was mesmerized the whole time. Personally, I found it lots of fun to watch Katy's face/reactions to the show. To say that her emotions were written all over her face would be an understatement. She insisted that every time a princess waved in our general direction that she was waving just to her. Ha! It was a late night (on a school night, no less! ), but we had fun on our special Disney on Ice outing! 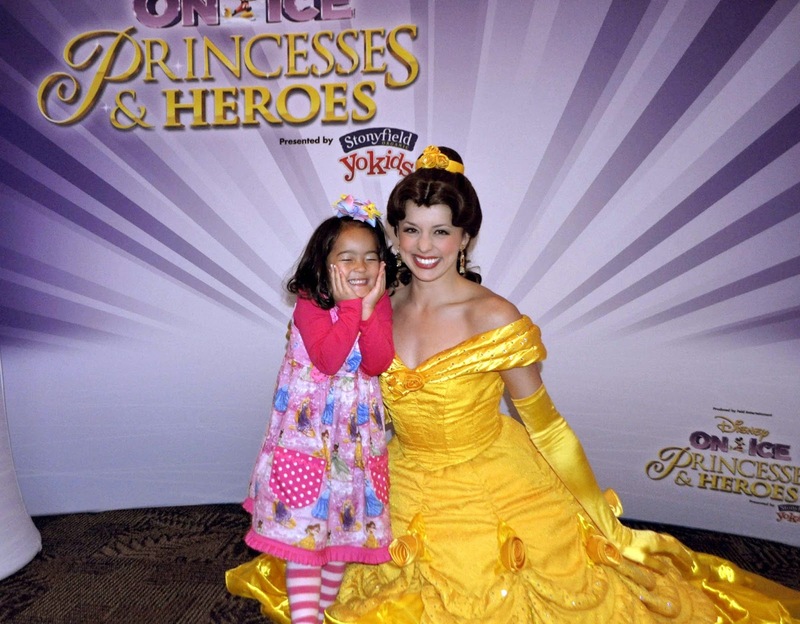 Katy was excited to meet Belle! Katy was equally enchanted to meet Snow White!